Helicobacter pylori (H. pylori) are bacteria that infect the stomach, usually in childhood, and typically go undetected. An H. pylori infection may result in the development of peptic ulcers and is thought to exist in around half the population of the world. The reason the majority of people do not realize they have an H. pylori infection is that they never experience any noticeable symptoms or sickness. Typically, treatment for an H. pylori infection will involve taking antibiotics to clear up the infection. You can consult with Dr. David Yamini or a member of his team at one of two California offices if you are suffering from peptic ulcers or other symptoms which may indicate the presence of H. pylori bacteria. We provide excellence in treatment and follow-up care in GI conditions for all patients, regardless of whether you choose our Beverly Hills or Santa Monica offices. What are the Signs and Symptoms of Helicobacter Pylori (H. Pylori) Infection? Although most people never experience symptoms that cause discomfort or pain from H. pylori infection, there are signs you can look for if you are not feeling well. Aching or burning in the abdomen area, pain that worsens with an empty stomach, nausea, lack of appetite, bloating, sudden and unintentional weight loss and frequent burping are some of the symptoms of an H. pylori infection. Due to the symptoms of H. pylori being similar to a number of other gastrointestinal conditions, you may wish to seek a diagnosis from an experienced gastroenterologist. 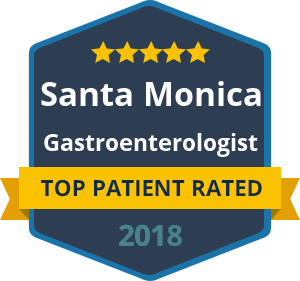 Dr. Yamini provides excellence in diagnosis and treatment of H. pylori for patients in and around Beverly Hills and Santa Monica. If you are experiencing symptoms that sound like those of an H. pylori infection, make an appointment at the offices of Dr. Yamini today. Our team is here to provide you with the relief that you need from pain and discomfort.